Heirloom Turquoise Jewelry originates with a fine Turquoise Gemstone and it is set by an accomplished and artistic Silver or Goldsmith into a work of art. Southwestern Artisans are inspired by high grade Turquoise as it brings out the creativeness of each craftsman who is lucky enough to have the opportunity to work with the stone. 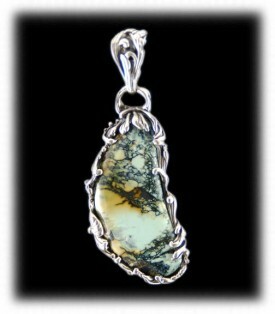 Most artisans go over the top in setting a top gem quality piece of Turquoise as it is so rare and hard to come by. This extra attention to detail will make the piece an heirloom that you will want to pass down through the generations. A Quality piece of Turquoise Jewelry is a piece of wearable art and it is so beautiful that it brings out the best in the person that is wearing the piece. There is a big difference between Heirloom Turquoise Jewelry and standard Turquoise Jewelry that is production made and intended for consumers that just want the look. High Quality Gem Turquoise is rare! About 5-10% of all Turquoise mined is considered high grade, professionally cut high quality Turquoise is valuable today and becoming extremely rare. It is even rarer to see Heirloom Turquoise Jewelry. 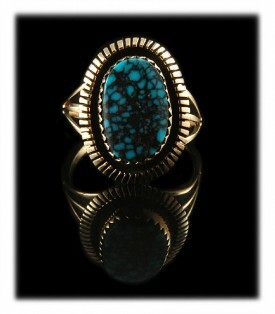 See my note on Heirloom Turquoise below! 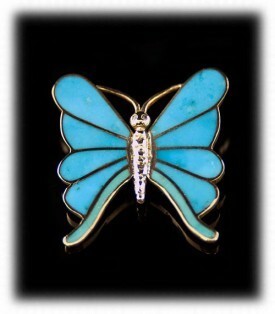 Heirloom Turquoise Jewelry is usually collected by individuals who appreciate high quality Jewelry. This type of person usually pays close attention to the details of the Jewelry they wear as well as all other details in their wardrobe. Fashion minded people, most often, seek out the best quality Jewelry from well known and trusted Jewelers, the situation is the same with Heirloom Turquoise Jewelry. To find trusted Heirloom Turquoise Jewelry, you must educate yourself to understand what constitutes the difference between Heirloom Turquoise Jewelry and Costume Turquoise Jewelry. High quality Turquoise Jewelry has always been hard to find, quality antique or vintage Turquoise Jewelry is very valuable today as it is truly rare! As is today, the majority of Turquoise Jewelry that was produced in the past was created as tourist trinkets and has value, however, the high Heirloom Turquoise Jewelry that was created by the best artisans with gem grade Turquoise is priceless and highly sought after by collectors and museums. 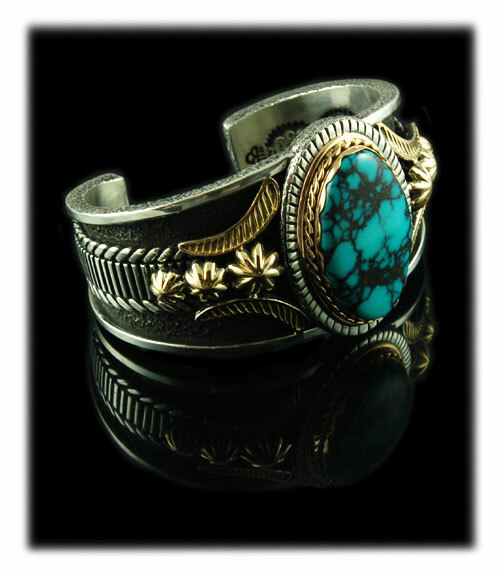 Durango Silver Company has been producing high quality Heirloom Turquoise Jewelry for over forty years. We have collected and personally mined Turquoise for over forty years and have accumulated one of the finest, authentic, natural Turquoise collections in the world. 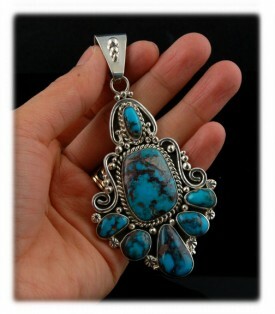 Our pride and the specialty of our company is producing the highest quality Heirloom Turquoise Jewelry possible. Our Heirloom Turquoise Jewelry is unique and special today and it will grow in value as it ages. We produce Heirloom Turquoise Jewelry and other quality silver jewelry that will become valuable heirlooms handed down through generations to come. Above and to the left is a 14k Yellow Gold and Paiute Turquoise Ring made by Toby Henderson, a master Native American gold and silversmith. This simple yet stunning ring is all about the stone and focuses on a rare spiderweb Turquoise cabochon from the Paiute Turquoise mine in Nevada, USA. This ULTRA RARE natural American Turquoise gemstone was set in a sawtooth 14k gold bezel and is surrounded by a stamped shadow box design. The clean and skilled gold work combined with the ultra rare natural Nevada Turquoise in this piece makes it a great example of Heirloom Turquoise Jewelry..
To the right is a Sterling Silver, 14k Gold and Turquoise ring by Native American Jewelry artisan Will Dennetdale. This one of a kind Turquoise and Gold Ring focuses on a top grade natural Damele Turquoise cabochon with black spiderweb matrix. This grade of natural gem Turquoise from the Damele or Damale mine is very rare and little was ever taken from the mine. The Damele mine is known for its rare lime green Turquoise, Faustite, and Variscite and the stone is an excellent example of why. This rare stone is set in solid 14k yellow gold and sits atop a heavy Sterling Silver band. This piece is a great example of silver and gold Heirloom Turquoise Jewelry with lime green spiderweb Damele Turquoise. To the left is a quality contemporary Sterling Silver and high grade Bisbee Turquoise cuff bracelet by American Indian Jewelry artisan Ben Yazzie. This stunning piece of Heirloom Turquoise Jewelry focuses on a top gem grade, natural Bisbee Turquoise cabochon. 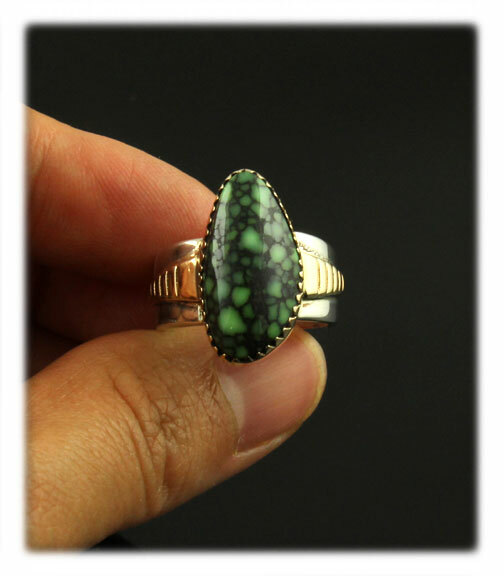 This giant hand cut gemstone of RARE AAA grade natural Bisbee Turquoise is amongst the best money can buy. This super hard Bisbee Turquoise cabochon is set in a handmade Sterling Silver bezel atop a sandstone or hammered silver textured, wide, Sterling Silver cuff bracelet. This piece is designed inside and out. The outside features overlain rock art designs. The inside of the bracelet has been stamped all the way around. Definitely a rare find and fit for a museum. To the right is another handmade Sterling Silver cuff bracelet by Navajo Jewelry artisan Ben Yazzie. 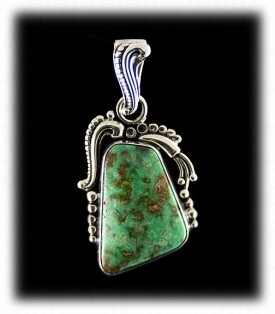 The focal point in this piece is the large rectangular cabochon of natural Spiderweb Turquoise from Nevada. This rare natural Turquoise gemstone came from the collection of a Nevada Jeweler. The stone is believed to be old black web Number Eight Turquoise. 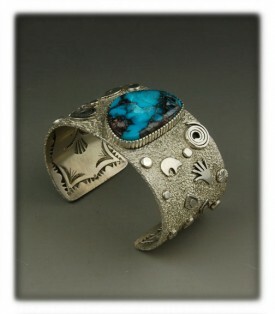 Look at the beautiful stamp work which highlights the wide silver cuff bracelet. The stone in this piece alone puts this bracelet into the heirloom Turquoise jewelry category, let alone the fine and skilled silver work in the men's silver bracelet. To the upper right is another 14k yellow gold and Blue Wind Turquoise ring for women. This piece of handmade Heirloom Turquoise Jewelry was custom made for a special customer of Durango Silver Company. 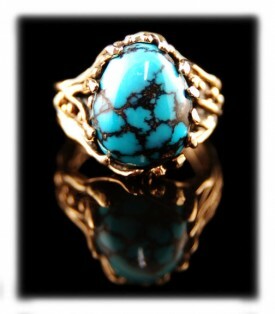 The star or the piece is a natural AAA grade spiderweb Blue Wind Turquoise cabochon from Nevada. 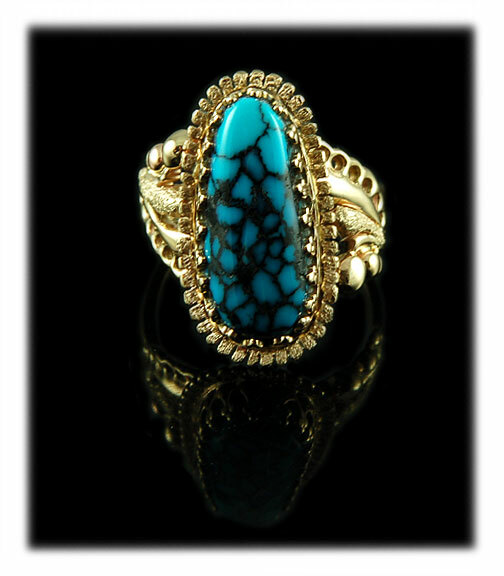 This rare blue Turquoise gemstone is set in a fancy 14k yellow gold filigree bezel and surrounded by a flat rope design. This women's gold ring features a beautiful hand stamped gold ring band with raindrop or ball accents. To the right is a Blue Gem Turquoise bead necklace by Nattarika Hartman. This necklace would be great with a casual outfit or great to wear with an evening dress. The necklace features 8mm roundel beads that graduate down to 4mm beads. These great blue Turquoise beads are from the Blue Gem mine in Nevada, USA. The necklace is finished off with a fancy flower and leaf hook and eye sterling silver clasp. These natural American Turquoise beads are very hard to come by these days which makes this piece a great example of Heirloom Turquoise Bead Jewelry. To the right is a handmade 14k yellow gold butterfly pin by Marian Packer with top gem grade natural Blue Gem Turquoise from northern Nevada, USA. It is hard to see in the picture, but the natural Turquoise in this piece is so high grade that almost glows. The natural Battle Mountain Blue Gem Turquoise is ultra hard and glassy. The center of the butterfly is made out of 14k white gold and features natural white diamond eyes. This is a one-of-a-kind Southwestern styled Necklace that will never be repeated and it was made by a well known and respected Artisan. 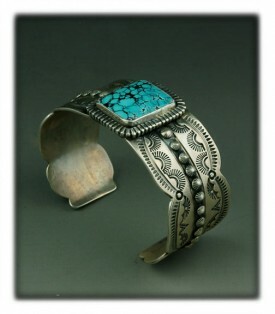 This piece of Heirloom Turquoise Jewelry will do nothing but grow in value and become a historic piece ofAmerican Art. 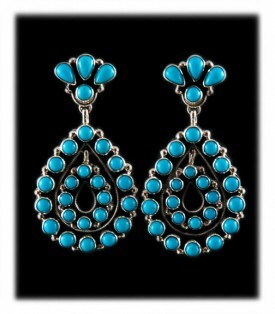 To the left is a fantastic example of a pair of heirloom Turquoise earrings. These beautiful Sterling Silver dangle earrings were handmade in America by Native American Jewelry artisan Emma Lincoln. These handmade Sterling Silver drop earrings are adorned with clusters of high grade Sleeping Beauty Turquoise from Globe, Arizona USA. To the right is a wonderful handmade Sterling Silver and natural Bisbee Turquoise cluster pendant by John Hartman. This piece is considered to be Heirloom Turquoise Jewelry due to the carat weight and ultra high quality of the natural Bisbee Turquoise in the piece and the amazing silver work. This piece will only grow in value over the years. Turquoise was one of the first gemstones found on earth by ancient Egyptians over 7,500 years ago. It has been coveted by Kings, Queens, Pharaoh's, Medicine Men, Spiritual Leaders and many cultures worldwide since its discovery. Quality Turquoise was found in Egypt, Persia, China, Tibet, and North America, however, only a small percentage of the Turquoise found has been high grade Turquoise. High quality Turquoise is rich in color and is a 5 or higher in hardness on the Mohs' scale. High quality Turquoise does not need to be treated or enhanced in any way to be used in Jewelry and it is a very durable gemstone that will naturally be stable for ever if it is taken care of and is in a stable environment. This is the best form of real Turquoise. Quality Turquoise has been recognized most recently as a very valuable gemstone by important collectors globally and Japanese investors have been paying record prices for the highest quality Turquoise. Due to evolving mining restrictions and the cost of mining most all of the Turquoise Mines in the USA have been closed. There are only three major Turquoise Mines in the U.S. still in production, the Kingman Turquoise Mine and the Sleeping Beauty Turquoise Mine and the Royston Turquoise mine. The Chinese Government has now closed all Turquoise Mining and has put a 3-5 year moratorium on Turquoise Mining in China, Turquoise from Iran (Persian Turquoise) is taboo and is rarely seen on the market due to many factors including political term oil. Egyptian Turquoise is nearly extinct. The bottom line is Turquoise is one of the top ten most popular gemstones in the world today and we are running out of it. As I said, there is only a small portion of high grade Turquoise from what is being mined. Authentic Turquoise and especially high quality Turquoise is about to go through the roof in value and authentic natural high quality will become even more precious. In the future Heirloom Turquoise Jewelry will be out of range for the common consumer, so now is the time to invest in Heirloom Turquoise Jewelry. We hope you have gained some useful knowledge from our Heirloom Turquoise Jewelry educational presentation page. We invite you to learn more about Silver Jewelry, Indian Jewelry and Turquoise Jewelry by following the links in our Learning Center which has many other informational pages that we have written on topics related to Southwestern Silver Jewelry. In addition, we would like to invite you to join our E-Mail Newsletter - about once every other month we send out a Newsletter to inform our members of what's happening with Durango Silver Company, new products, specials for our members and more. 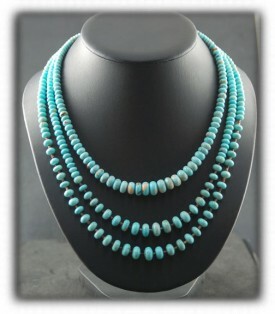 We also have a monthly drawing from our members to Giveaway free Turquoise Jewelry from our company. Please take a moment to become one of our friends and future winners in our giveaway by signing in below. Thank you for reading and learning about Heirloom Turquoise Jewelry.